Ever wonder how to get more large clients? Do you have the thought that all you need in order to get your revenues to the point that they need to be is that core set of Fortune 50 clients? Do you know what it takes to actually penetrate the gatekeepers at the ‘Dells’ of the world? 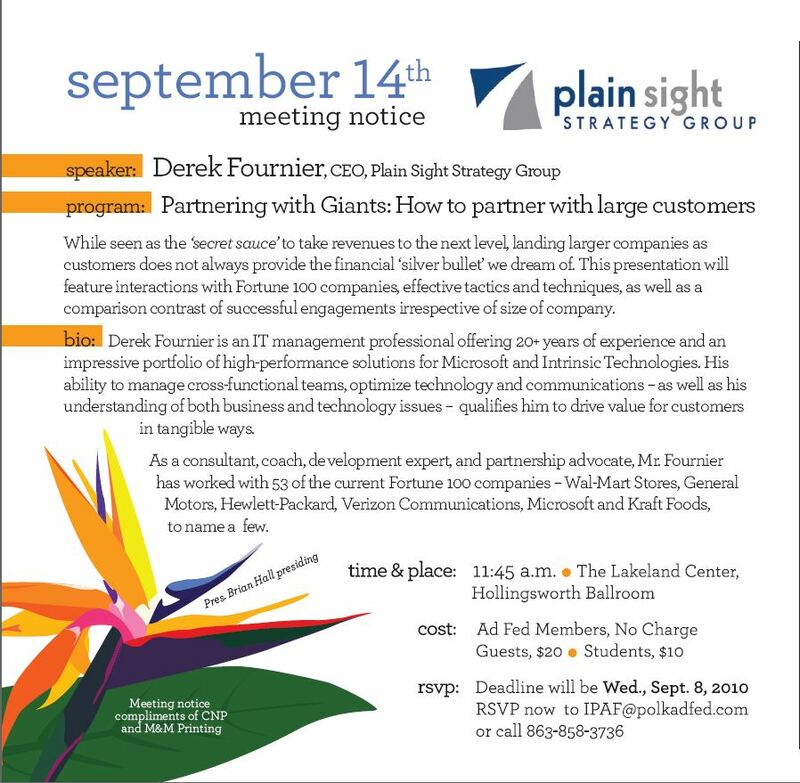 Well, in the presentation, “Partnering with Giants: How to partner with large customers,” Derek Fournier will be discussing the whys, whats and hows of landing large clients and explaining that you sometimes have to be careful what you ask for. The presentation is at 11:45 AM on September 14th at the Lakeland Center (Hollingsworth Ballroom). The event is free for Ad Fed members but others are welcome to attend (Guests are $20.00 and students are $10.00). This presentation is being presented to the American Advertising Federation, Polk County Chapter. Special thanks to President of the Chapter, Brian Hall for lining up the session. To contact Ad Fed about attending this presentation (or any Ad Fed related topics) please contact IPAF@polkadfed.com of call 863-858-3736. The deadline is Wednesday, September 8th for registration. We hope to see you there! Can a leader be silent?